Accumulation of white or yellow phlegm with rattle like cough and labored breathing. Chronic bronchitis, asthma and emphysema, expelling pus from pulmonary abscesses are some of the imbalances satisfied clients have used this product for. Platycodon grandiflorum root, Activated carbon, Botanical wax, Talcum. - Jie geng, Activated carbon, Botanical wax, Talcum. Use with caution for chronic cough due to Yin deficiency. 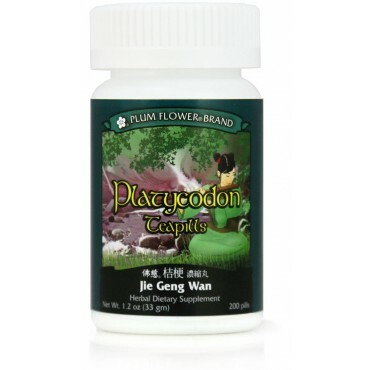 Use with caution in individuals with nausea, as the rising nature of Jie geng/platycodon may cause Stomach Qi to rise.